Burial at Sea, Episode One is good but not essential - the only piece of BioShock story content you could say that about. I'm being attacked by splicers again. I've got little health, no EVE, and only a few bullets for each of my four guns. I'm about to die, which is annoying, because I'd prefer to spend that money refilling all the things I'm low on. Elizabeth calls out: she's found some EVE. I can use this. I catch a splicer with the Possession plasmid and, in the confusion, use my last shotgun shell to blast another. I then call for Elizabeth to materialise a freight hook, so that by the time I've Sky-Hooked (sorry, Air Grabbed) to reposition, my shield has recharged. I dismount, slamming into another splicer, and finish by using my buffed melee range to execute the last enemy, just as his possession wears off. 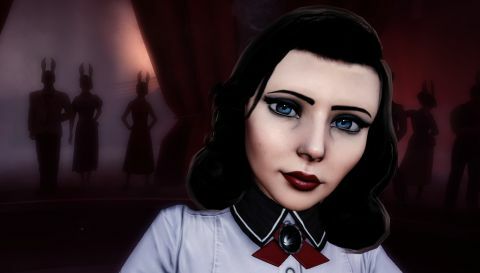 Such encounters are common in Burial at Sea, Episode One. It's BioShock Infinite's combat, retooled for BioShock's underwater city, but with fewer available resources than you'd find in either game. The resulting mix of scavenging and desperation ensures that you'll use the entirety of its systems - Plasmid, gun, Gear, and tear - out of a natural necessity for survival, rather than simply because they were there. For all this DLC's mysteries, twists and, yes, disappointments - and as clumsily as Infinite's tools have been massaged into Rapture's structure - it's the most fun I've had fighting crazed magical addicts. Which is just as well, because despite a non-violent and story-heavy first section, the bulk of this two-hour adventure is combat. It starts with Elizabeth - older and more hard-hearted than she was in Columbia - arriving in the office of Rapture's resident PI, Booker DeWitt. She hires him to help find a child he has some past connection to, and the two explore a small shopping district, in search of the McGuffin that will let them progress. The big draw of this episode is that you get to see Rapture before it descended into madness. As with Infinite, however, it's less a living city and more a stage. It feels like you're walking around a movie set, its actors performing on cue. Only, without the visual overload that was the open, constantly moving Columbia, the artifice is even more apparent. That's not to say there isn't splendour. This whole section is lavish in its design, and culminates in an encounter with Sander Cohen that's full of detail, drama and enjoyable scenery chewing. Then it ends, and you travel to an isolated, dimly lit pocket of the city to shoot, burn or freeze a familiar procession of the violently insane. Burial at Sea offers some brilliant standalone moments, builds on BioShock Infinite's ending, and, thanks to fluid, reactive combat, is enjoyable throughout its short adventure. But it fails to feel cohesive, and suffers from a cliffhanger ending that, in its desire to tease the next episode, dampens the impact of this one.